My favorite everyday tea. Neutral on sensations. Smooth taste good. Черный чай с лепестками роз - просто замечателен, насыщенный вкус и нежный аромат роз. I really like this tea. It has a fine aroma and produces a nice liquor even for the second time. I can only recommend it to everyone who wants to taste something nice. This is the first keemun i´ve ever tasted and it doesn´t seem to suit my taste. The flower petals are pretty but i detect no floral taste, just smokey black tea. I did not expect that hint of smokiness at all. extraordinary delicious tea light smoked and beautiful colour whith rose petal. I drink it in the afternoon. 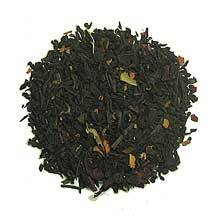 Easy tea with good ballance between rose/tea flavours. A nice tea, It has a hint of rose aroma that is not too strong and not too weak to notice that is a very nice addition to this tea. It’s very good with a little bit of milk if you like that. It goes well with various kind of food. A nice easy drinker. The rose is natural and not perfume-y. It lends a pleasant note to the good simple keemun taste, which is slightly sweet. Nice breakfast tea, pairs well with simple foods.